Of course movement alone CAN condition a horse, but if you’re developing a horse for a specific event, with specific challenges (like less than ideal ground conditions) then it requires a more specific program. 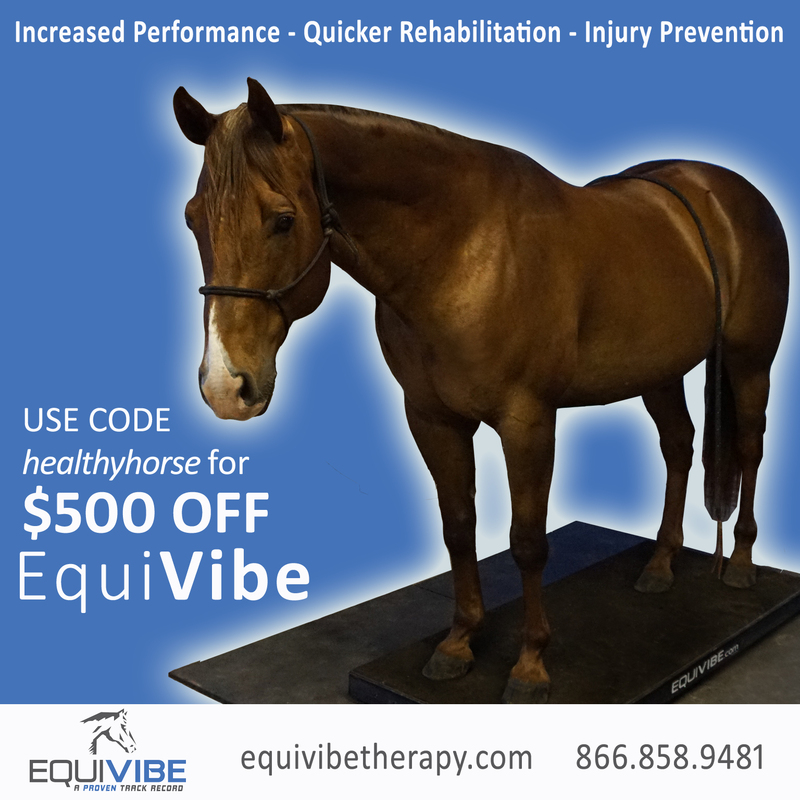 If your horse has certain tendencies, whether related to how he’s put together, or how he’s been trained and ridden, or even damaged and injured in the past, all this requires that we adjust our program based on our horse’s individual needs, AND make sure it’s in alignment with our goals and supportive of our horse’s long term well-being. 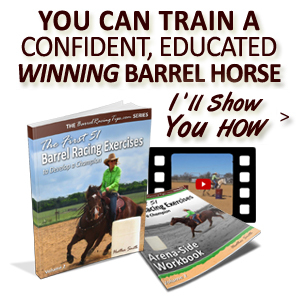 When I first set out to prepare my gelding to return to barrel racing after three years away from it (in large part due to an injury), I already had a feel for where I needed to focus my efforts. Today I’ll be sharing how I’ve been taking things a step further by analyzing and making changes to his movement patterns and how I ride him to take our success in competition much further as well. Goals: Create habits of engaging the hindquarters, elevating the front end, reaching more deeply forward with weight shifted back for more even balance on all four feet. You might wonder what all these details about one horse has to do with your horse, or other horses – because they’re all different as individuals, right? 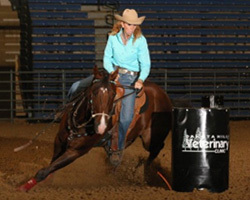 Well it just so turns out that what Pistol REALLY needs right now, is something that almost every barrel horse needs. Although I might not need to focus as much in these areas with Dot Com for example, quality movement and correct posture is something we all want to emphasize. Consider that at a gallop a horse carries 60% of their weight on the forehand, and 40% on the hind. This ratio ideally shifts as a horse prepares for and turns a barrel. Of course there are some winning front endy horses out there, some with terrible posture on the pattern that still clock. However, it’s my belief that many of these horses could perform better and certainly last longer with more balanced movement on the pattern and off. 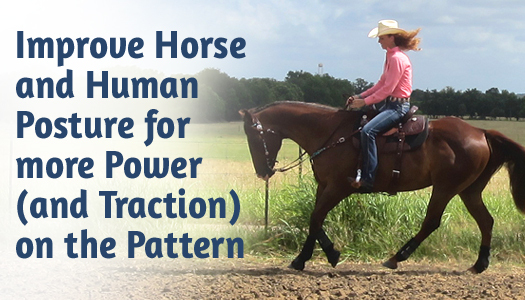 Because we spend a portion of time at speed, this means that it’s easy for the tendency to move with more weight on the front end to spread into how our horses move in general, and especially through the turns. However, this doesn’t have to happen if we know how to take counter active action. The first big step is having the awareness to realize that our horse’s habits might not be contributing to our success on the pattern. The great news is that we don’t have to take a passive role when it comes to enhancing athleticism in any horse – it can be done on purpose! Below are a couple photos showing progression before Pistol was sidelined in 2012. After – same outfit, one year later. In the images above, it’s obvious that my body position is different and that Pistol mirrors it, but we had both worked hard to make lasting changes to the movement patterns we defaulted to in a run. It showed in our form – and it showed on the clock! When it comes to creating high(er) quality movement, keep in mind that it’s subjective. What “quality” is for one horse (or person) might look and feel different for another, again because they (and we) are all different from the ground level. If a horse has well-established, but poor movement patterns on the barrels, but they don’t seem to contribute to any problems (no soundness issues, no shouldering or tipped barrels, etc.) and the horse is still competitive, then it’s an individual decision as to whether one should or shouldn’t attempt to fix what doesn’t appear to be broken. Then again, just because the poor movement patterns are working for the time being, doesn’t mean they aren’t contributing to future problems down the road. It’s always possible to counter act the symptoms of poor movement patterns on the pattern, while you’re OFF it to start with. This is the route I’ve with Pistol. His conditioning in the past couple months has been barrel specific, but with six weeks remaining until we plan to enter up, I haven’t actually reintroduced the entire barrel pattern yet and feel no need to very soon. I’m working to completely re-create Pistol’s habits away from the clover leaf so that it will be even less likely that he’ll revert to his old “style” when we do start working the pattern. 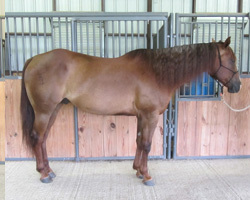 A barrel horse makeover of this caliber takes time. While I’m all for testing things as I go, I don’t want to throw away the great things I’m in the process of building by testing too much, too soon. Shoot for quality at ALL gaits! (I prefer to see the poll at or above the withers and the face vertical, not over-flexed). 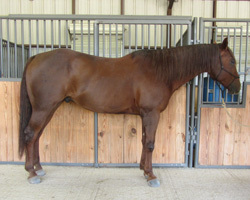 Again, my objective has been to encourage more elevation of Pistol’s withers neck and head, discourage him from over-flexing at C2 (with the nose not greater than perpendicular to the ground), to carry more weight on his hind quarters in general, to reach more deeply under his body with his hind legs, while maintaining softness, to have more consistency in this posture, and to strengthen his body and teach him to be responsible for carrying it himself. My intention is for him to have all this in small, barrel-size circles with the ultimate goal to create easier, quicker and more fluid transitions into the turn, and powerful posture to blast through and leave them quickly. I use techniques that in part stem from both dressage and reining. I’ve taught Pistol to seek, reach for and stretch into bit contact to form a powerful arc of roundness and strength over his topline. I’ve been spending quite a bit of time in this frame, all the while ensuring his energy is connected to my seat. 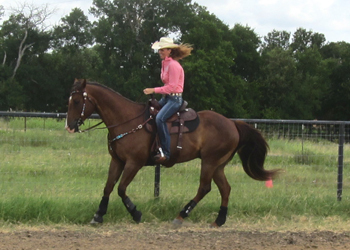 This is what prevents a barrel horse from learning to push or run through our hands – the meaning of the bit depends on what my body is doing. In the end, my goal is always “quality” with no contact necessary! For example, if I start posting strongly in the saddle and engage the reins, I expect my horse to really power forward into the contact. If I hold an engaged (think abs) posture in my body, but release the reins, at advanced stages when he has built up adequate strength, I expect him to hold that frame on a loose rein (think reining horse). If I want him to stop, I’ll stop riding, sit deep in the saddle and make contact with the reins if necessary. To enhance this seat connection, I always start by communicating with my body FIRST, then follow up with the reins only if necessary. I motivate my horse to make good choices by making it uncomfortable to ignore my subtle requests and giving releases for a job well done – sometimes this means micro-releases while in motion or BIG rest breaks for a job REALLY well done! 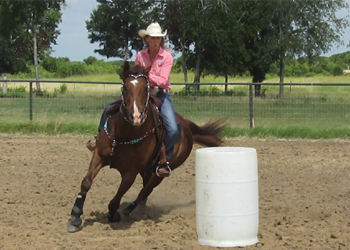 Being that stopping and backing off bit pressure is so critical for barrel horses, I don’t spent a lot of time in later stages riding with a lot of contact, mostly for the sake of avoiding micromanagement (potential dullness), but also to minimize confusion. I use the bit contact initially to teach quality movement, similar (but not exactly) to how a person would with a dressage horse, and although I might revisit this from time to time, I’ll expect my horse to do the majority of even collected movement without contact. Encourage reach into the contact – can you keep the softness even with speed? I do a lot of back and forth to accomplish this. I engage my core and ride how I want him to move, use contact if necessary to get it, then little by little ask him to hold it. First in straight lines, then large circles and gradually smaller circles, which are much more challenging. As Pistol is becoming more conditioned, I’m asking him for collection and softness with some speed and actually holding bit contact while I really encourage him forward while maintaining roundness. So many horses are not “broke at speed” because we’ve never asked for softness or anything remotely close to longitudinal (over the topline) flexion and balance at more than a lope. To create higher quality movement, I have a lot of awareness of how I’m using my own body. To help Pistol elevate his front end, I focus on keeping my chin and eyes UP (notice my old bad habit of looking down in pic above). 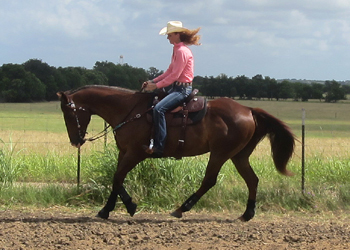 When we’re loping, I exaggerate the highest moment in the stride to extend it upward and forward. 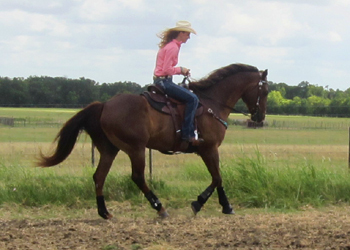 I quicken then lengthen the moment in the stride when his hind legs push off and trail out behind and quickly encourage them to reach far forward again. If he’s not connecting his feet to my seat, I might tap his rear a bit for motivation or do whatever is appropriate and necessary to get the result I’m after. It’s OK if the head goes up a bit, as long as they aren’t resistant or emotional. When I ask him to circle a barrel, I’m not throwing slack away yet, because his old habit is to dive in on the front end. Think of it this way – if he were a carousel horse, in days gone by his “pole” was more so on his inside front leg in the turn. I’d rather it be in the center of his body behind his withers. To help make this transition, I’m very careful to keep my eyes up as I approach the turn and not start it too soon. If anything, we’re going a hair deeper into the turn than I’ll want in the end, again – to counter act his tendency to lean in and start too soon (most common at the second barrel). Sometimes horses will dive in legitimately due to what they lack in athleticism. Sometimes, WE start the turn too early, because WE are not quick enough to get it together last (fraction of a) second. Many times that it happens, it’s that we haven’t taken these steps for developing balanced, quality movement. While some folks have pretty extreme habits of leaning to the inside, I have a habit of stepping very hard to the outside in a turn. While we might make subtle adjustments here, it’s my belief that just a hair (only a hair) more weight on the outside is ideal. No matter how badly a horse tends to lean in, the answer isn’t necessarily for us to get really extreme about throwing our weight around – in general, balance is better! 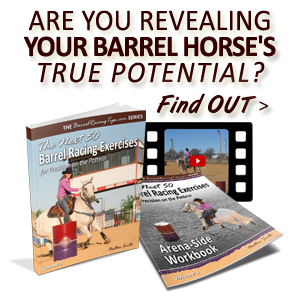 I’ve shared the specific goals I have for Pistol and the steps I’m taking because I feel as though any barrel horse would benefit from more attention being paid on intentionally creating more positive movement patterns and posture – which leads to power! Our end goal is for it all to be expressed on the pattern, but it’s built in many ways over many months no where near the pattern itself. 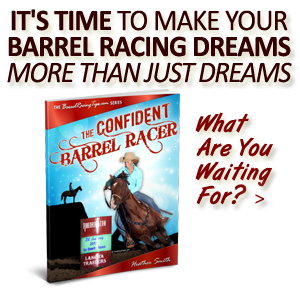 I hope you’re empowered with new insights and encouraged to take your barrel racing to another level as well! I wanted to share a description from Karen Rohlf outlining how we can benefit from incorporating “dressage, naturally” into our program, PLUS some reining horse inspiration from recent big winners Todd Bergen and Platinum Vintage. 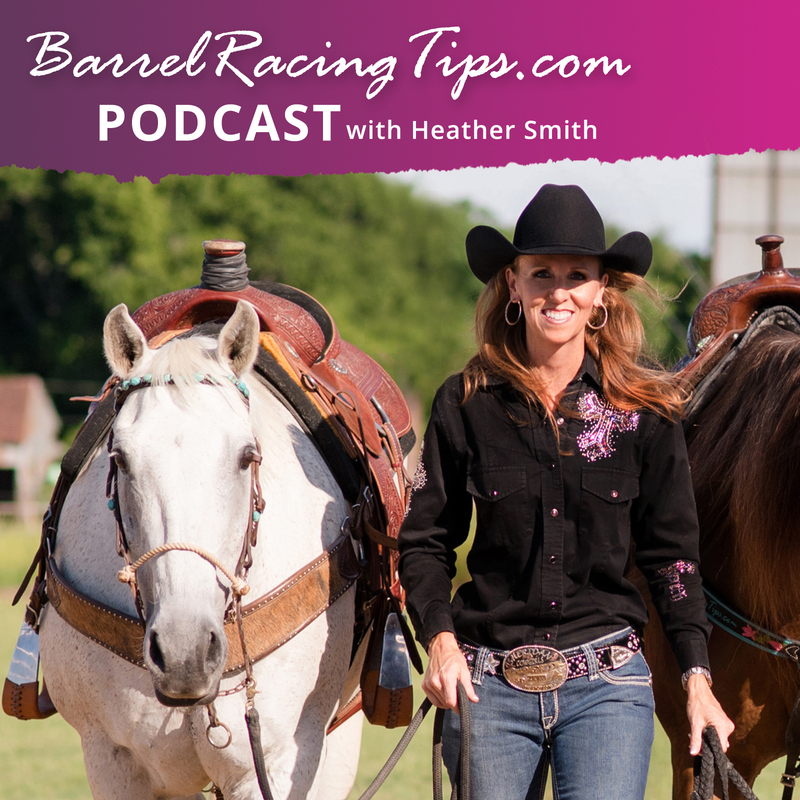 While I don’t want my barrel horses to be trained and developed exactly like a dressage or reining horse, there are SO MANY elements from both disciplines to pull into and enhance our barrel racing. Whataya think? Let’s hear your experiences, thoughts or questions! For more on quality movement, collection, and changing our riding habits check out the resources below. 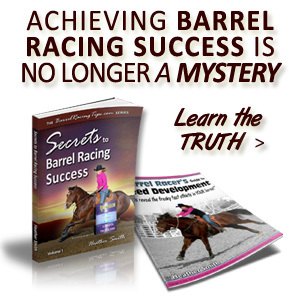 How to Kiss Bad Barrel Racing Habits Good-bye!